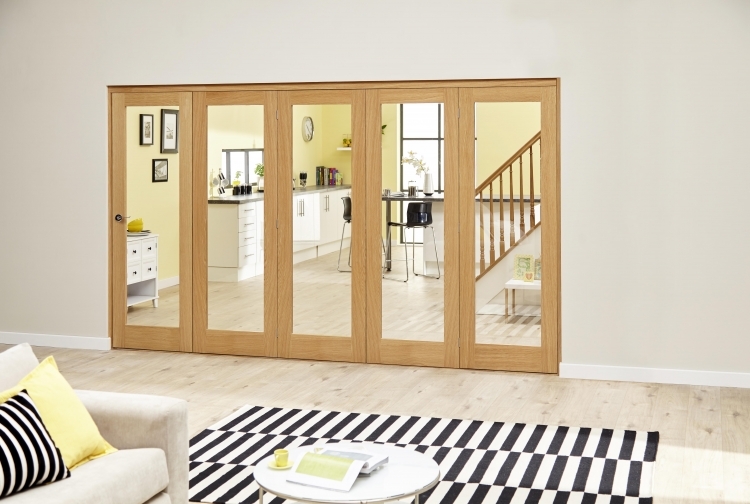 This clear glazed prefinished oak Roomfold Deluxe system from ClimaDoor door is a high quality, but relatively low priced internal bifold doors system. THIS SYSTEM IS SUPPLIED WITH PRE FINISHED LACQUERED DOORS AND FRAME SO YOU HAVE NO DECORATING TO DO! These Roomfold Deluxe systems are available in 3, 4, 5, and 6 door systems, using slimline 381mm, 419mm 457mm or standard 533mm, 573mm, 610mm, 686mm and 762mm wide prefinished oakclear glazed internal doors, giving you a wide range of potential opening sizes from 1215mm wide right up to 4671mm wide. Slimline Door leaves have narrow 60mm stiles to meximise the glass area. Standard door leaves have a 110mm stile width as standard. To decide on the best solution of which bi folding doors are for you, take time to review the opening sizes and product sizes available before selecting the option to buy. This top hung system consists of Prefinished Frame pack, prefinished oak solid core glazed doors, hinges, running hardware, head track, base track and brushed stainless steel drop bolts and is provided in flat pack format. Joiner recommended for assembly and installation. If you have a size that is near to any of those listed, give us a call and we'll advise you on whether any of our products are suitable.